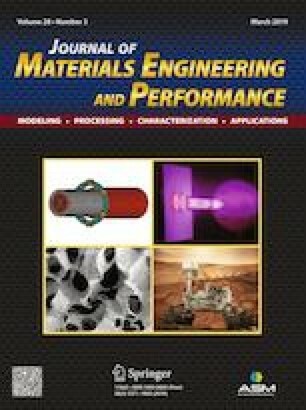 In this study, three types of aluminum alloys (Al-Li, Al-Ga-In-Sn and Al-Li-Ga-In-Sn alloys) were prepared via vacuum arc melting technology. The microstructures of the alloys were examined by x-ray diffraction (XRD), scanning electron microscopy (SEM) and energy-dispersive spectroscopy (EDX). The water discharge method was used to evaluate the water–aluminum reaction. The results show that the Al-Li alloy is inert in aqueous ambience, whereas the Al-Ga-In-Sn alloy and Al-Li-Ga-In-Sn alloy rapidly react with water. Meanwhile, the Li addition hinders the aluminum–water reaction mainly due to the formation of AlLi and Li5Sn2 intermetallic compounds, which causes a lower H2 generation rate and a lower H2 yield of the Al-Li-Ga-In-Sn alloy than those of the Al-Ga-In-Sn alloy. This work was financially supported by National Natural Science Foundation of China (Grant No. 51171201), National Basic Research Program of China (2010CB631305), the Key Scientific Research Projects in Henan Province (18B430007), the Academy of Finland (Grant No. 311934), the Program for Science, Technology Innovation Talents in Universities of Henan Province (17HASTIT026), Education Department of Henan Province (16A430005) and the Science and Technology Innovation Team of Henan University of Science and Technology (2015XTD006).